Several years ago, following an official state visit to Tokyo, Japan, Putin was a guest at the famous Kodokan headquarters of judo. In attendance were many officials including Japanese Prime Minister Mori. 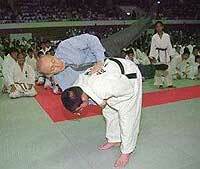 Yukimitsu Kano, the grandson of Kodokan Judo's founder Jigoro Kano said, "President Putin started Judo when he was very young, and has continued practice until now. He had a wish to visit the Kodokan institute. 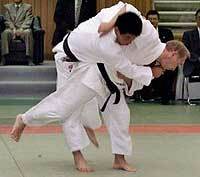 We are very happy to have him and welcome him as a judo member."